Recognizing the overwhelming need and requests for real time energy data, GreenEarthEquities launched it’s eMontior program in January 2012. Partnering with Energy Circle, GEE has negotiated a reduced price for all eMonitoring devices and is investigating further subsidy options. Our first install was in the home of GEE’s project manager, Rogelio Covarrubias located at 4404 N. Eddy Fresno, CA 93727 (click to view installation videos Part 1 and Part 2). The eMonitor worked perfectly, gathering useful information immediately upon installation (click to access overview webinar). Click here to contact GEE for information on eMonitors and special pricing. eMonitor is a service that lets you view your home’s 24×7, minute-by-minute electricity use, electricity cost, and carbon footprint, as well as historical information by day, month, or year, all in a password protected web site, with an exceptional graphical interface anywhere you can access the Internet, including a special iPhone App. eMonitor goes far beyond just your current usage and displaying the raw data it collects from your house — the eMonitor service analyzes your usage and presents information in aggregate and in detail in a number of ways that help you understand how your home is using energy, what it all means, and importantly: what you can change in order to use the energy you need, efficiently, effectively, and smartly. While other stand-alone hardware solutions provide a snapshot of your usage at any given moment, the eMonitor service collects data and stores it over time so that you can see how your home operates as a system. 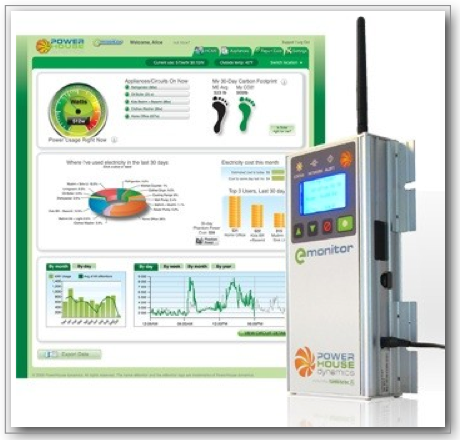 No other energy monitoring system comes close to the level of detail, analysis and actionable information that the eMonitor service can provide. The cutting-edge feature of the eMonitor service is its capability to display electricity use by individual circuit so you can see real-time and historical information of everything using energy, not just major appliances, entertainment centers, and air conditioning, but also the circuits you may not have realized are actually a significant part of your home’s energy usage. In addition to storing detailed historical data on electrical usage, the service keeps you continuously up to speed on your home’s energy usage by providing you with a broad set of alerts, sent by email or text message. For example if circuits are overloaded, if there are problems with appliances or your renewable sources, if your electricity usage is unusual, or if your energy bills are approaching a threshold (set by you). eMonitor “r” models integrate with renewable energy systems (for solar PV, solar thermal, or wind installations), monitoring energy production, savings, and efficiency, and also reports on any problems with those installations. In order to record and transmit the information from your home, you’ll install one or more eMonitor hardware modules in your house and connect it to your home’s Internet connection. Each module can record the usage and other data from the electrical circuits in your house. The eMonitor hardware is very flexible and easily installed near to your home’s electrical service entrance. Each eMonitor configuration comes with hardware to monitor a number of “channels” — typically a channel is the same as one of your electrical circuits. But eMonitor is flexible enough to handle cases like 240v “unbalanced” circuits, several smaller circuits “bundled” into a single channel, sub-panels, larger services with multiple panels (e.g. 400a, 600a, etc), panels in different locations, inputs from solar, wind, generators and almost any electrical configuration found in North American homes having 2-phase 240v electrical services. Most American homes can be covered with one eMonitor 24, which includes hardware for two 120v mains, and 22 additional channels. Additional configurations are available for homes with more circuits, fewer circuits and almost any residential electrical service we have seen! The eMonitor is also equipped for future capability to remotely control individual outlets and thermostats, and will integrate with many existing home control systems. Planned future enhancements also include the ability to monitor other energy sources such as natural gas and home heating oil. The eMonitor modules allow a wide range of configurations. In a typical home, there’s a single main service panel with two main wires (“phases”), each carrying 120v. The mains distribute power to individual circuits — usually from one 120v phase. Larger loads like dryers, air handlers, ranges, and so on use power from each of the two phases to have a single 240v circuit. The eMonitor hardware has a fixed number of “channels” — 2 are needed for the main phases, and in a simple configuration one channel for each 120v circuit and each “balanced” 240v circuit — 2 channels are needed for unbalanced 240v circuits such as dryers and water heaters. We recommend monitoring each circuit separately, but there are cases where you can “bundle” two or three circuits into a single channel. Circuits not monitored will be recorded as a single measurement. The “r” models enable monitoring and separate display of inputs from renewable energy sources. Signficant additional functionality is enabled in these units so are highly recommended if your home is powered by solar panels or wind. The “r” models are not needed for power inputs like backup generators.The “s” models are used for sub-panels, or to allow monitoring additional circuits on a larger service panel and therefore can only be purchased to extend a system. The “s” models do not come with the special sensors needed to record the main power leads — otherwise, they are the same.